Rumors of the death of American jazz have been grossly exaggerated, if you believe the creatives behind this month’s Jazz Is Dead concert event. A one-night-only celebration of the recent wave of vitality in the genre—particularly jazz’s intersections with hip-hop, pop, and electronic music—takes over the Lodge Room in Highland Park on December 14. Expect a mix of live performances, DJ sets, and fun surprises from need-to-know artists working in contemporary jazz. 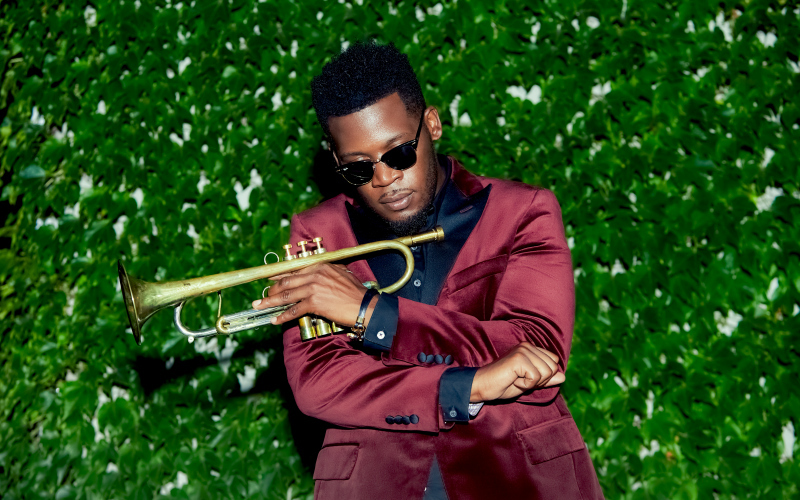 Headlining the show is trumpet player Keyon Harrold, who is currently supporting his critically-lauded album The Mugician, which includes collaborations with Big K.R.I.T, Gary Clark Jr, and other household names. Previously, he’s been heard on tracks with Beyoncé and Common, and even filled in as Miles Davis’ playing in the Don Cheadle-starring biopic, Miles Ahead. We caught up with Harrold to learn a bit more about the Jazz is Dead project and what it means to play a truly American form of music in an era of global tension. Jazz is Dead takes place December 14 at 8 p.m. at Lodge Room, 104 North Avenue, Los Angeles. Tickets are available online for $20; the event is all-ages. You’ve described yourself as a “social music activist.” Can you tell us what that means to you and why it feels so important to use art to make a statement in these times? There are so many situations going on that simply need an honest advocate; a voice willing to grind with reason and is willing to consciously highlight the realities viscerally. Music is a potent weapon that I call on to bring about change and progress. Like a furnace, it can ignite some, inspire others and shine a light so bright and cast a shadow so dark, that it may change the hearts of people. It is important to me that I record the melodic times that we live in. The beauty of our times and equally the tragedy both inspire sonic journals that speak to the soul sometime deeper than the depth of words, indescribable truths; joys, frustrations and yearnings must bring down walls. Can you tell us a bit about the Jazz Is Dead showcase and how it fits in with what seems like a huge moment for contemporary jazz, perhaps particularly in the L.A. scene? This music that I love is alive and well and thriving. It needs accessibility. “Jazz is Dead” is shock factor, a way to get people to pay attention, to take notice, to smell the roses and appreciate the nuances of an art form that is truly American. Dru Lojero and I want people to question and assume and be uncomfortable with that statement. I want people to come out and make their own conclusion. Be caught up in the vibes and colors of music. What is are you looking forward to in the new year? 2018 is gonna be a big year for me. I am touring my album The Mugician. I am really looking forward to a very exciting film project that will be my first full score, a new Keyon Harrold record, and more collaborative projects that will surface.